Barnamala Roy has a MA in English from Presidency University (Kolkata, India). She has worked as a Sub-Editor with Kindle Magazine based out of Kolkata where she covered articles on literature, culture, philosophy, gender and society. An avid bird watcher, bird-keeper and bird photographer, she pens poetry, fictional and non-fictional pieces which have begun to increasingly feature fauna and flora. Currently, she is exploring the community occupations around natural ecosystems and native species in remote areas of West Bengal. She also freelances as editor and translator. Ornamental or aquarium fish cultivation, starting out as a pastime, has evolved into a successful aqua-industry. The aquarium fish-keepers, who form the backbone of this industry, have given it the status of the world’s second most popular hobby after photography. In this regard, the Howrah district by the river Hooghly and Galiff Street in North Kolkata are the biggest commercial centers for propagating the trade and hobby. The ‘Hathibagan Haat’ of Kolkata was, for a hundred years, the largest wholesale ornamental fish market in the eastern and north-eastern zone of India. Now, it has shifted to ‘Galiff Street’ in the northern part of the city on the bank of the canal called ‘Marhatta Ditch’. The proximity to the Howrah and Sealdah railway stations, Kolkata port and the Dum Dum airport makes the location very strategic for export and import of fish (Ghosh 2003; Mahapatra 2003; Datta 2003). Hobbyists and naturalists flock the ‘Haat’ every Sunday for ornamental fish, decorative and indoor plants, birds, other pets, and accessories needed to maintain the respective hobbies (fish feed, fertilizers, planting pots and bird cages).The sales are over by the end of the morning, so there is usually a rush in the early hours. While Galiff Street caters to aquarium fish hobbyists, wholesale business of a larger dimension takes place in Dasnagar, Howrah (Kolkata). Dasnagar is named after the founder of the Bharat Jute Mill, Alamohan Das -- a legendary philanthropist, whose belief in the Bengalis’ ability to do business, has perhaps infused a spirit of entrepreneurship in the locals of this region (Mukherjee 2014). Fish farmers and retailers gather from North and South 24 Parganas, Naihati, Medinipur, Udayrampur, Amtala, Jafarpur and from the north eastern hilly regions (Assam, Meghalaya, Arunachal Pradesh, Sikkim, Nagaland, Shiliguri) with their produce of ornamental, as well as food fish. Exotic varieties like arwana and the playful flowerhorn cichlids, distinguished by their caps, which cost up to Rs. 2000-2,500 each are imported from Bangkok and Singapore. Before export, the fish from various parts West Bengal are kept and readied in aquaria in rented rooms, garages or depository constructed solely for this purpose, replete with CCTV cameras. A community of ornamental fish farmers breed diverse species round Dasnagar; they contribute their observations to the collective learning about fish maintenance and trade, proceeding by trial and error method, says Swapan Kundu, who has been practicing this for nineteen years now. 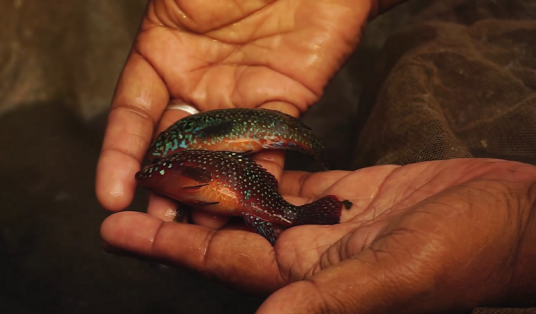 Kundu has traveled extensively to all ornamental fish hubs in the state (and beyond) to catch unknown tricks of the trade, and to collect species from the wild, like the blue danio fish from the river at Bishnupur. He has been initiated into this craft by Somnath Mayur, who owns the largest packaging unit and ornamental fish store in the area. Somnath farmed fish in his early years, when farmers within a distance of 10-20 kilometers, turned up at his outlet to buy spawns/fish. He quickly transitioned to exporting fish, having passed over his skill to fish cultivators in the Dasnagar locality. A network of farmers now regularly supply produce to his packaging unit, currently in its 32nd year, and as many as 200-250 cartons of fish are transported by rail and by air to Mumbai, New Delhi, Chennai and Bengaluru. Of the 200 indigenous ornamental fish exported outside India, 85 per cent originate from the North East region to be reared and sold from wholesale units in Howrah (Mahapatra 2003; Vinod 2003; Mandal 2003). In the domestic market, 50 per cent breeding units sell their produce to the rearing units, while 40 per cent goes to large scale whole sellers. 10 per cent breeding units are involved in direct marketing. He estimates that nearly 50,000 people are dependent on this trade in West Bengal; in his shop, approximately twenty workers handle the day to day activities. The fish packers at Somnath Mayur’s outlet have devised a uniform to facilitate packaging chores -- they wind cardboard paper round their feet to check constant exposure to water and (paper) straps on their fingers to avoid injury while stringing the packets close. Except for Sundays, they are busy from 9 am to 4:30 pm in arranging fish into packets, with proper oxygen supply and medicated water (to avoid gas formation from fish faeces), that are then delivered in cartons and boxes straight to the airport, and rail stations. 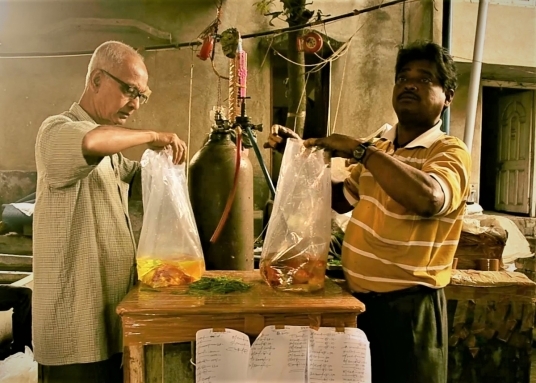 Loknath Naik, employed in the packaging unit for the last 25 years, says that the packers need to have sound knowledge on each ornamental variety (even if they have never raised/cultivated fish at home) to ensure the fish can travel safely to another city. They fix the packing density of fish keeping in mind several factors like 'species tolerance to stress', 'size', 'transit time', 'health and stress status of fish prior to packaging' (Mathew 2016; Mercy 2016; Mahapatra 2016), so that the fish can survive for two to three days. With the upsurge of Self Help Groups for women, and the support of National Bank for Agricultural and Rural Development (NABARD), the National Fisheries Development Board (NFDB) and the Marine Products Export Development Authority (EMPEDA) in building infrastructure for ornamental fisheries, many women are now engaged in ancillary activities in this sector. Other than packaging, every second household in Dasnagar is employed in aquarium and fish craft. An array of shops selling fish feed, aquariums and related accessories -- filters, pumps, thermostat, light fittings, artificial plants and models -- fill the lanes. Women hold managerial positions in the shops. Homemakers and schoolgirls earn their pocket money by fabricating aquarium toys and plants. Artists from Krishnanagar (Nadia, West Bengal) supply clay models of animals to the stores. The material with which the local workers craft the aquarium supplies are imported from China and Bangkok; the stones for aquarium floors come from Rajasthan. The individual entrepreneurs often take great pains in finding a rare variety of ornamental fish, different from the varieties of the same species sold in the markets. In that case, they only sell the male fish/spawns among an ornamental variety they have exclusively bred to keep the breed to themselves, thus, disabling any other farmer from producing the same strain. While farmers in Israel, Singapore and Japan can afford to dedicate a whole farm to the quality production of a single species, producers here can barely do so. This is because the cost of perfecting a breed, and maintaining it would not tantamount to the income they generate. In Bengal, hobbyists settle for an inferior quality pet for meagre prices, unlike in New Delhi or Mumbai (where they pay handsome amounts), so most of the fish produced locally goes for wholesale export, regrets Ram Parui, a fish farmer from Domjur (Howrah). His father, Samar Parui is an independent farmer for two decades, who took up ornamental fish-craft against the wishes of his father who ran a bangle factory. 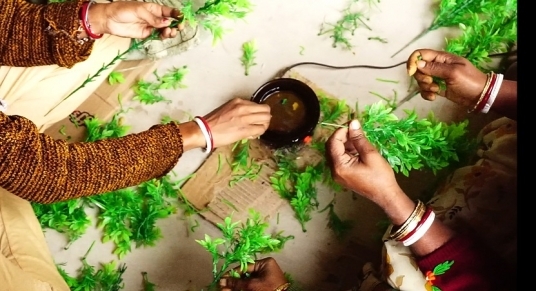 The bangle factory still forms part of the family business but, fish cultivation takes precedence, because the sales have dipped for the former (overtaken by non-native businessmen). Samar Parui has distinguished himself by devising new methods at low-cost cultivation: he was the first in India to breed rainbow fish constructing a make-shift water-spring in his courtyard on a slope. He now breeds them in a hatchery. To patent a method of cultivation, would require an enthusiastic customer-base to support the move, thinks Samar. But, the interest in aquarium fish-keeping in West Bengal is as long as it remains a low-maintenance and cheap pastime. The Paruis cited an incident of mixed breeding which produced a red variety of the jewel fish, and has reached raging popularity in the market, over its natural green variety. But often shopkeepers who buy these produces in wholesale from fish cultivators reject hybrid fish (with great potential) as damaged species so, they have to minimize experimentation. Dr. Bijoy Kali Mahapatra, Principal Scientist at CIFE attributes the low market prices in West Bengal to the easy availability of ornamental varieties in this region, compared to other states where production zones are scarce or undeveloped. Exclusive (fishery) institutes have not been assigned to work on developing the ornamental fish sector; central and state institutes take up subsidiary research projects on it along with their primary involvement in food fish. The market, too, is not organized in the ornamental fish sector yet, though outlets and district level aquaria are opening to better popularize the trade. Recently, an ornamental fish hub has also opened at Sector 5, Kolkata but activities are yet to start in full swing, informs Dr. Mahapatra. By promoting the captive breeding and farming of certain ornamental fish species that are fast becoming endangered, scientists are ensuring the conservation of their gene pool, and saving other fish (with a plentiful stock) from natural wastage (Sinha 2012; Mahapatra 2012). Awareness programs to check over-exploitation of wild species, and training to ensure eco-friendly collection have been planned to propagate ornamental fish, and to sustain livelihoods of a huge population. According to Mahapatra, 'The global market for ornamental fish for public aquaria is less than 1% at present and over 99% of the market for ornamental fish continues to be confined to the hobbyists (2003).' Aritra Mukherjee from Liluah, West Bengal took up the hobby from a sense of responsibility ten years ago, when his friend presented him a Koi carp fish in a plastic jar. Koi is generally consumed as food in Bengali households, and known for its hardy nature; surviving hours on land, and often reaching the kitchen (and the frying pan) alive. He did not have the heart to cook the fish, and instead, it lived on as a family pet with minimal care (inside that jar) for a long time. Looking after the koi fish triggered his interest to buy actual ornamental varieties, which he procured from the Belur bazaar, a few kilometers by road from Liluah. He admits his mistake of beginning the hobby untrained, owing to which, he kept more number of fish than suitable in a glass bowl -- mixing varieties as disparate as gold fish, angels, catfish and fighters. Though all these species were of the smallest size, since, they had to compete for space, they started killing each other. Besides, their scales were rendering a reddish tinge to the water, dirtying it, for which he had to clean it every day; the fighter fish, when kept separately in a jar, to prevent harm to the other fish also dirtied the water within hours. Faced with these practical problems, Mukherjee approached an entrepreneur from Liluah, who keeps aquarium species in four tanks at his home, and sells them from his outlet at Belur Bazaar. Unlike the Jafarpur Ornamental Fish Society or independent famers in Domjur and Udayrampur, he does not breed the fish he sells, but is dependent on spawns he collects from the market (or directly from nature), which he then raises at his place. With the entrepreneur’s help, he arranged an aquarium and learnt about fish maintenance. Among the varieties of gold fish he now keeps, the oranda and red cap both developed caps, which surprised him at the outset, because caps are more characteristic of the latter. While the gold fish are more peace-loving than many of their ornamental cousins and would not generally kill a live fish, they feed on the dead of their own clan. He deduced this habit when some fish went missing from the aquarium occasionally, and all that could be retrieved of them were a few bones when he cleaned the aquarium water. In spite of a decade of cultivating the hobby, he has never heard of Dasnagar -- the busiest ornamental fish hub, located only a railway station away from his home town, which indicates the low publicity of this trade (undoubtedly affecting the domestic business). Dr. Soumi Nandi’s (a zoologist from Sealdah, Kolkata) interest in fish-keeping was kindled by her father’s love for the same. She recalls her father buying aquarium fish in her childhood, from the Hathibagan market for their Dumdum residence. She has now moved to Sealdah with her husband, but inculcated the hobby as a habit. She vouches for the superior variety and quality of ornamental fish, procurable at reasonable rates, at the Galiff Street market -- open only on Sundays -- over the ones sold at shops in Sealdah. Her observations tell her that the hobby has many takers, given the customers who throng Galiff Street and several homes in her neighbourhood alone maintaining aquarium fish. At her home, she has two setups for the fish -- a drawing room aquarium which hosts dani soni, zebra, neon tetra and a tub on their balcony, layered with soil beneath the water to resemble a natural pond, for molly and guppy fishes. She has experimented with the variety of fish she buys, keeping angels, gold, gouramis, guppies and mollies and varieties of cichlid in turns, discovering that goldfish and angels outlived other species. A fish-packer (Loknath Naik), a zoologist (Soumi Nandi), an export business manager in this sector (Somnath Mayur) and a fish farmer from Udayrampur (Kandon Ghora) all owe their livelihood or passion for aquarium fish to a culture of fish-keeping at home. The ornamental fish sector, hence, is the bedrock of all possible cultural and commercial exchanges, and allows innovative enterprises to germinate, generating income for men, women and children alike. The hobby which sustains the business provides relaxation and helps us relearn the art of nurture, is fast disappearing from urban life. Ghosh, A., Mahapatra, B.K. and Datta, N.C. 2003. 'Hatibagan Haat, Kolkata: The Largest Wholesale Ornamental Fish Market of Eastern India'. Fishing Chimes. 23(1): 166-168. Ghosh, A., Mahapatra, B.K. and Datta, N.C. 2003. ‘Ornamental fish farming – Successful small aqua business in India.’ Aquaculture Asia 8 (3): 14-16. Mahapatra, B.K. 2008. ‘Ornamental Fish Culture’. A Diversification of Crop Livestock System.’ In Complementary Role of Livestock and Fisheries Towards Sustainable Farming in North East India, edited by Anubrata Das, A.K. Kumaresan, R.K. Bardoloi, K.M. Bujarbaruah and S. Naskar, 210-221. Barapani, Meghalaya: ICAR Research Complex for NEH Region. Mahapatra, B.K., K. Vinod and B.K. Mandal. 2005. ‘Export Potentiality of Ornamental Fish from North Eastern Hill States of India with a Note for Development of such Fisheries.’ Environment and Ecology. 23(4): 780-786. Mathew, Hanson K., Mercy, T.V. Anna and Mahapatra, B.K. 2016. 'Conditioning and packaging of ornamental fish for transportation.' In Best Management Practices for Freshwater Ornamental Fish Production, edited by Atul Kumar Jain, V.P. Saini and Vaneet Inder Kaur, 141-152. National Fisheries Development Board: Hyderabad. Sinha, Archana and Mahapatra, B.K. 2012. ‘Indigenous Ornamental Fish, Their Propagation and Trade.’ In Diversification of Aquaculture, edited by Archana Sinha, Subhendu Datta and B.K.Mahaptra, 103-115. New Delhi: Narendra Publishing House.